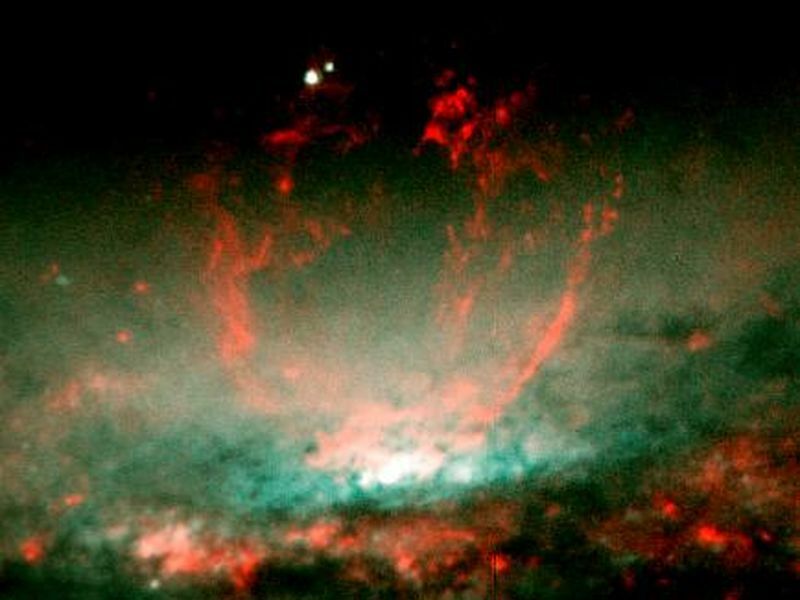 A lumpy bubble of hot gas rises from a cauldron of glowing matter in a distant galaxy, as seen by NASA's Hubble Space Telescope. The image, taken by Hubble's Wide Field and Planetary Camera 2, are online at http://hubblesite.org/newscenter/archive/releases/2001/28/image/c/. 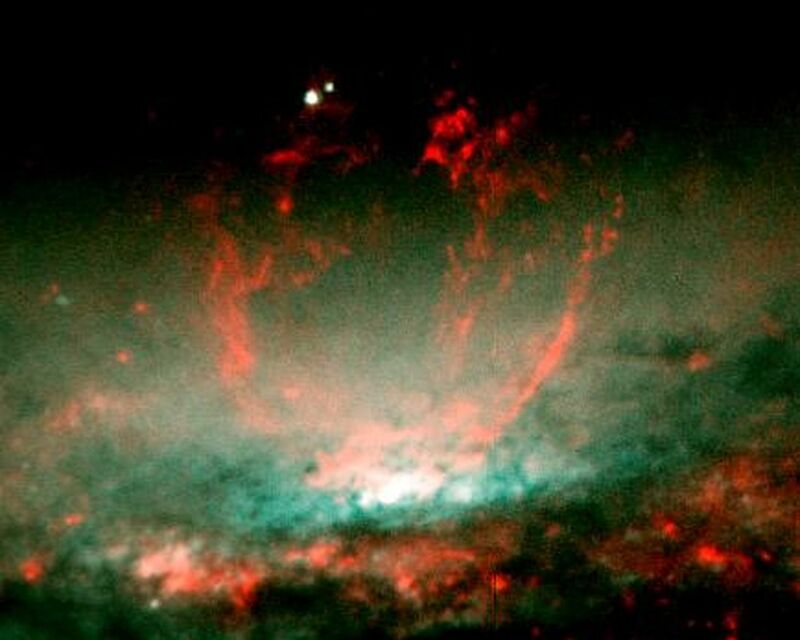 The camera was designed and built by NASA's Jet Propulsion Laboratory, Pasadena, Calif.
Galaxy NGC 3079, located 50 million light-years from Earth in the constellation Ursa Major, has a huge bubble in the center of its disc, as seen in the image on the left. The smaller photo at right shows a close-up of the bubble. The two white dots are stars. Astronomers suspect the bubble is being blown by "winds," or high-speed streams of particles, released during a burst of star formation. 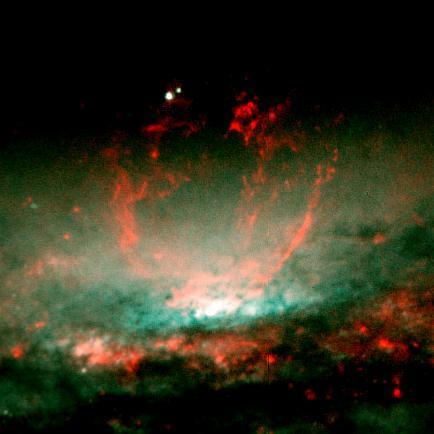 The bubble's lumpy surface has four columns of gaseous filaments towering above the galaxy's disc. The filaments whirl around in a vortex and are expelled into space. Eventually, this gas will rain down on the disc and may collide with gas clouds, compress them and form a new generation of stars. Theoretical models indicate the bubble formed when winds from hot stars mixed with small bubbles of hot gas from supernova explosions. Radio telescope observations indicate those processes are still active. Eventually, the hot stars will die, and the bubble's energy source will fade away. 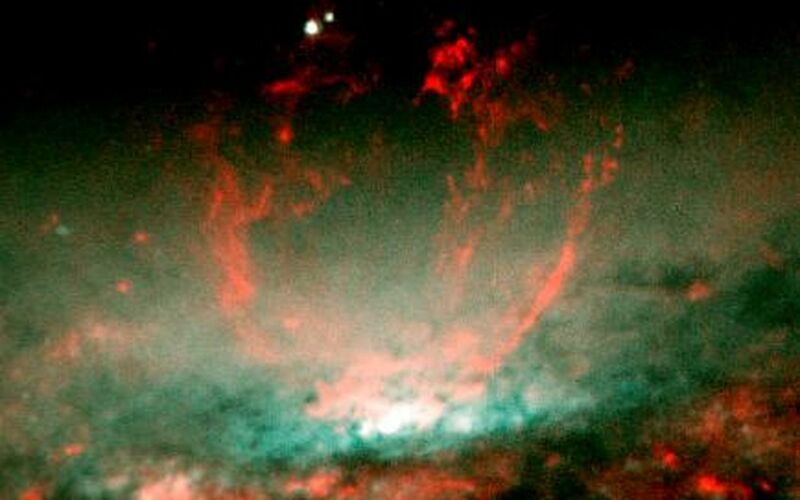 The images, taken in 1998, show glowing gas as red and starlight as blue/green. Results appear in the July 1, 2001 issue of the Astrophysical Journal. Additional information about the Hubble Space Telescope is available at http://www.stsci.edu/hst/. More information about the Wide Field and Planetary Camera 2 is available at http://www.stsci.edu/hst/wfpc2. The Space Telescope Science Institute, Baltimore, Md., manages space operations for Hubble for NASA's Office of Space Science, Washington, D.C. The institute is operated by the Association of Universities for Research in Astronomy, Inc., for NASA, under contract with the Goddard Space Flight Center, Greenbelt, Md. The Hubble Space Telescope is a project of international cooperation between NASA and the European Space Agency. JPL is a division of the California Institute of Technology in Pasadena.